Marc Marquez wins the Japanese Grand Prix to clinch his fifth MotoGP title in five years! The 25 years old Spaniard is now level with Mick Doohan in terms of total premier class championship titles. 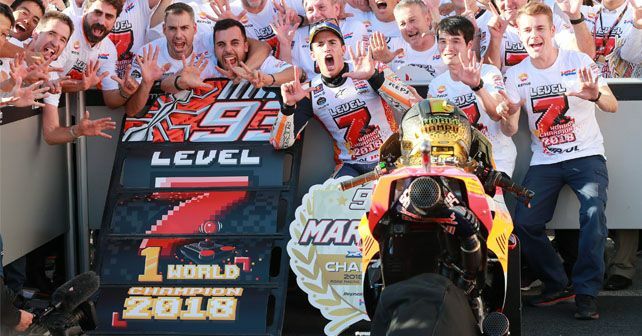 Let’s cut straight to the chase - Marc Marquez is the 2018 MotoGP World Champion! The Repsol Honda rider clinched his fifth premier class title (seventh overall) at Honda’s home race in Motegi, Japan, as his nearest title contender, Ducati’s Andrea Dovizioso, crashed out in the second last lap while fighting with Marquez for the race win. Behind an ecstatic Marquez was LCR Honda’s Cal Crutchlow in second and Suzuki’ Aleix Rins in third. In order to win this year’s championship, Marquez had to finish in front of Dovizioso at Motegi. However, it looked unlikely all weekend since the Ducati rider was in top form in all the practice sessions and qualified on pole. Marquez, on the other hand, was placed sixth on the grid before the start of the race. As the lights went out, Dovizioso made a clean start and took the lead. As you’d expect, Marquez didn’t hold back and had a lightning launch, which helped him gain three places by the very first corner of the opening lap. He then quickly dispatched Crutchlow to take the second spot. As we’ve come to witness in the past, it was again a game of chess that was being played by Dovizioso and Marquez - for more than half the race distance, none of the riders showed their actual pace and they were lapping slower than the riders behind at one point in time. Marquez, however, looked comfortable behind Dovizioso despite facing some occasional challenge from Crutchlow. In the closing laps, Dovizioso upped the pace and Marquez followed suit. Both the riders left Crutchlow behind and were looking to be headed for another last lap duel. With three laps to go, Marquez got in front, while Dovizioso was glued to his rear wheel. The battle raged on with two laps remaining, but on this occasion, the otherwise calm and composed Dovizioso faltered and crashed out. In the final lap, Marquez simply cruised to victory to lift the 2018 MotoGP World Champion title. Crutchlow finished in second, after narrowly beating Suzuki's Aleix Rins (third). Movistar Yamaha's Valentino Rossi was fourth, ahead Angel Nieto's Alvaro Bautista in fifth and Tech 3 Yamaha's Johann Zarco in sixth. Rossi's teammate Maverick Vinales finished in seventh, followed by Repsol Honda's Dani Pedrosa in eighth and Pramac Ducati's Danilo Petrucci in ninth. Hafizh Syahrin of Tech 3 rounded out the top ten. There are three more races to go, with the next round set to take place at Philip Island in Australia.